Effective data tracking is the key to leverage our client’s strengths. A better understanding of visitor behaviours leads to an efficient inbound marketing strategy and relevant redesigns. 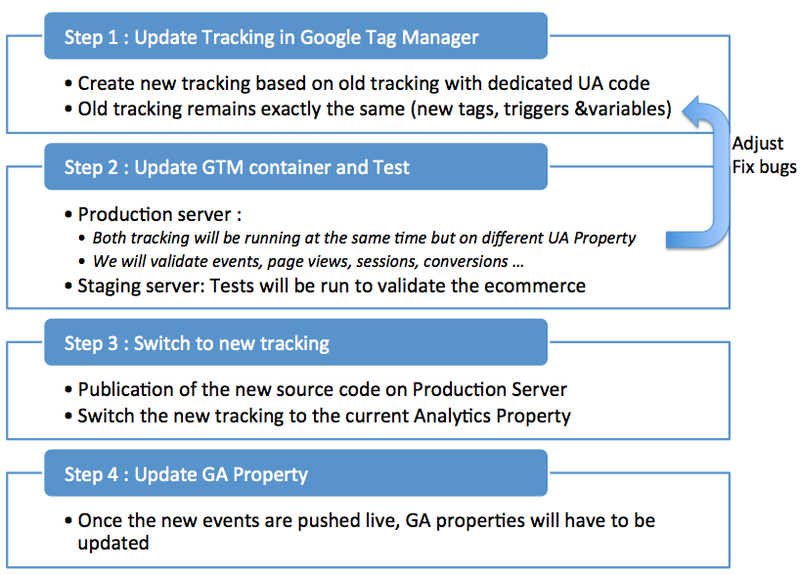 To reduce the discrepancy between analytics data and the client’s system sales data, and to amplify the client’s visibility, we configured the Analytics property and updated the GTM container. Users connecting to the internet from within the client’s properties are automatically redirected to the client’s website as soon as they connect to the internet. Even though this traffic is relevant, it overflows marketing data and reduces visibility on performance. A custom channel grouping has been created in order to separate this particular traffic from other sources. We restructured, updated the client’s exiting tags, triggers and variables. We removed obsolete tags and variables. We ensured the information needed by Google Tag Manager was provided using the Datalayer: Technical Specifications, Debug and Support. We implemented enhanced e-commerce (behaviour, checkout, transactions) and added custom dimensions (Product Type, Type of Booking, Size of Group, Event ID). Before the new tracking system was deployed, we tested, monitored and adjusted while both tracking systems were live. 13.4% of the overall traffic is now a dedicated channel: Internal Wifi. It no longer impacts metrics such as number of sessions, bounce rate or conversion rate. The difference in bookings between Google Analytics and Client System has been reduced by 38%. Identify segments of customers who are falling out of the shopping funnel. More accurately identify key stages within the funnel that require attention to improve conversion rate. Identify best-performing product by using the new custom dimensions. Better track and monitor performance for all kinds of conversions and transactions.